When we first created a Hanglay recipe, it was a bit frustrating that we did not have an authentic Thai hanglay powder to use in the recipe. Hanglay is always made with a specific powder, quite similar to our Thai curry powder but a bit different. Similar to massaman but without the coconut milk. The main ingredient is pork, and you can use a fatty belly pork or other cut of your choice. Other distinctive ingredients are ginger and pickled garlic. 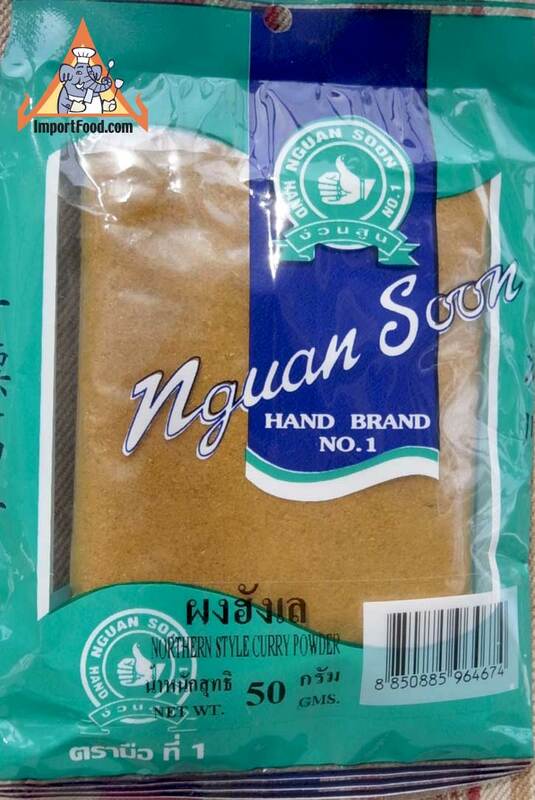 After working with Hand Brand, the number one spice company in Thailand, we have created this formula based on the true Hanglay powder made in northern Thailand. It created based on an authentic hanglay powder created for the "One Tambon One Product (OTOP)" entrepreneurship program designed to support locally made products. Each package is a generous 1.75 ounces which will last for a long time. We'd love it if any customers of ImportFood.com would make hanglay at home, and submit photos of it here at our hanglay recipe page. We also offer Hanglay Curry Paste from Mae Pranom.